The kitchen is more than just a place to prepare a meal; it is a gathering point for friends and family on every occasion. Much like a timber frame home, a kitchen should reflect your style and personality as well as be a functional space for everyday life. Whether you want your kitchen to be center-stage in your timber home’s design or you would like it to fade into the background of your sweeping great room, there are several ways that your kitchen’s design can fit your desired look and feel. The focus of many when designing a kitchen is placed on the cabinets, countertops and other fixtures. Don’t forget to look above when going through this process. Design options for your space might include a high vaulted ceiling and dormer windows to allow for more natural light or more custom accents such as bents and truss work. If you desire a less complex design, a flat ceiling with minimal accents throughout the space will achieve this. 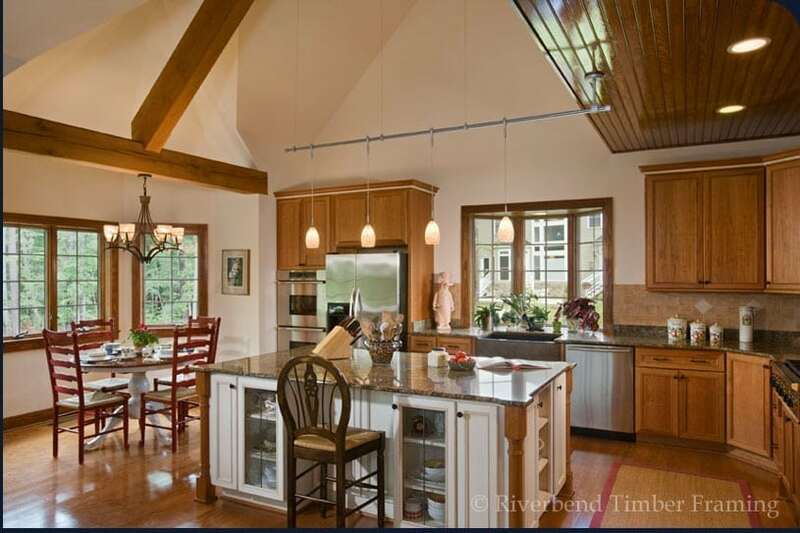 Working with your Riverbend designer can help you to find the perfect ceiling that blends well with the kitchen area. With the unique structural and decorative appeal of timber framing, how do you envision it within your kitchen space? Do you want more or less timber in the space? Would you like to include complex truss work or more simple designs? Do you want the timber in this room to be the focal point, to simply accent or do you not want it visible at all? Having your timber framing visible within your kitchen can create a more vivid look, while something as simple as incorporating your framing into your cabinets can give off a distinct, yet subtle appeal. What Style is Your Kitchen? While timber framing can have a powerful appearance, this material choice does not have to seal the style of your kitchen. If you are aiming to build a rustic timber home with that theme seen throughout each living space, consider highlighting the craftsmanship of your timbers in your kitchen space. Or consider fewer timbers in the room for a different look and feel. 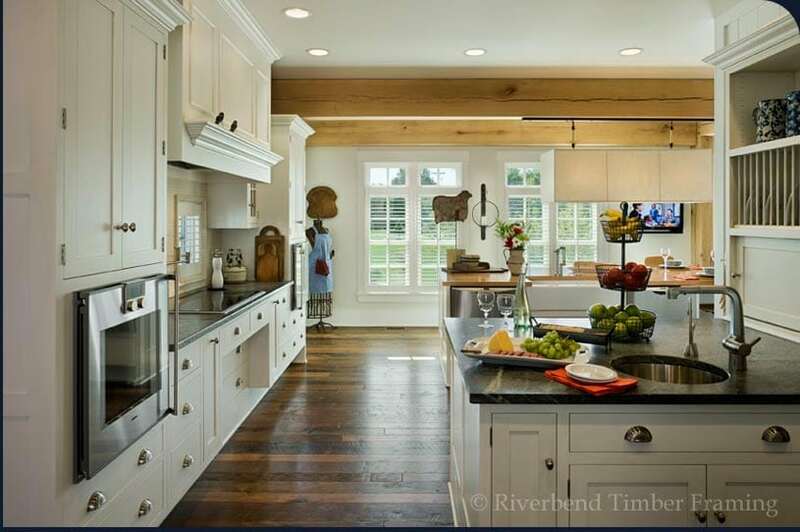 Whether you want a country, modern or European style kitchen, Riverbend has the tools and experience to design the layout and style of any look you are hoping to achieve. Designing and using your kitchen is always a fun thing to experience. There are a lot of factors to think about when planning, even in the beginning stages. By having a goal in mind for your ideal kitchen, you can work with your Riverbend designer to achieve your unique look and feel.